Compared with what the former fishing village looked like just half a century ago, Pattaya in the second decade of the 21st century has developed not only into a bustling beach resort with millions of visitors every year but effectively one of Thailand’s biggest cities. To find your way around Pattaya, is still fairly simple, though, even for first-time visitors. Pattaya’s main hotel, residential and entertainment districts are embedded between the coastlines of Naklua, Pattaya and Jomtien in the West and Sukhumvit Road (highway to Bangkok) in the East. The area east of Sukhumvit Road is also known as the “Dark Side”. 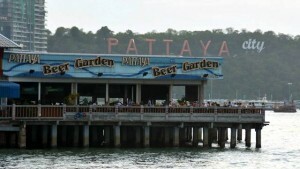 Here’s a brief guide to Pattaya’s main tourist areas. For a detailed map of Pattaya and advice how to easily find your way around town, please see our Map of Pattaya and Get Around in Pattaya pages. Speak German? Um mehr über Pattayas beliebteste Stadtviertel zu erfahren, und wo gerade Deutsche am liebsten absteigen, schaut doch einfach mal auf unserer neuen deutschsprachigen Pattaya Info-Seite vorbei! Naklua, situated north of Pattaya, is still very much the old fishing village, with traditional wooden houses and of minor touristic significance except for its popular weekend market. There is no notable beach in Naklua itself, and only a few hotels and guesthouses can be found there. What many tourists often wrongly denote as Naklua is actually only the northern part of Pattaya along Pattaya-Naklua Road (i.e. the northern extension of Pattaya Second road, north of the Dolphin Roundabout) which has more and more extended and actually merges with Naklua. 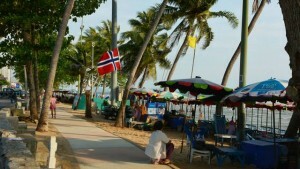 Since the 1970s, North Pattaya has developed into Funtown’s “Little Germany”, with mostly German-speaking visitors, dozens of German and Austrian restaurants, a sizeable number of beer bars, one or two Gogo bars, and various little shops and tourism-related businesses along the main Naklua Road. In recent years, more and more Russian and Chinese tourists have also discovered North Pattaya and spend their holidays here in ever-growing numbers. North Pattaya has its own Wongamat Beach which has traditionally been more quiet than Pattaya’s main beach and a good alternative for holidaymakers who enjoy sunbathing in a more relaxed atmosphere. Due to Pattaya’s ongoing property boom and ever-increasing numbers of tourists, however, dozens of new hotels and high-rise condominiums have sprung up like mushrooms on Wongamat beach in recent years or are currently under construction; so while it’s still more quiet here than on Pattaya’s main beach, unfortunately it’s no longer as idyllic as it once, especially during the high season months. South and Central Pattaya, with hundreds of upscale hotels and guesthouses of all standards, a variety of shopping malls and markets, restaurants, entertainment venues, bars etc. 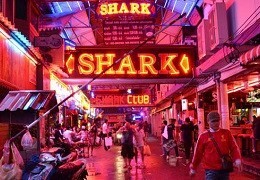 are the main centres of tourism, shopping and nightlife in Pattaya. Granted, due to the large number of motorboats and jet skis and the traffic noise of Beach Road in the back, Pattaya’s main beach may not be very inviting for beach-goers who enjoy sunbathing and swimming in a relaxed and tranquil atmosphere. A walk along the busy beach promenade, however, is always a great way to pass some time; otherwise, just sit and lean back on a bench, watch the bustling life on Beach Road pass by and enjoy one of Pattaya’s famous sunsets. 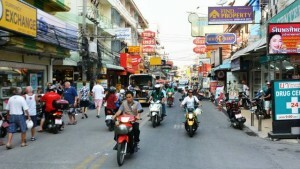 During the day and early evening hours, South Pattaya is all about shopping. You will find literally hundreds of little shops and stalls along Beach Road, and unless you’re in a shopping mall where fixed prices apply it’s always possible to bargain and make a good deal. After sunset South Pattaya turns into Funtown at its best, with fancy lights and music everywhere, and fun-seeking night owls all over the place. While not limited to it, Pattaya’s world-famous Walking Street is the unrivaled epicenter of nightlife in Funtown and always worth a visit. Entertainment venues include traditional-style international pubs, live music venues, open-air bar complexes, beer bars, GoGo bars, discos, karaokes, and whatever fastidious revelers and party animals may expect from a place that appropriately describes itself as “the extreme city”. We must admit that if you’re not into “extreme” nightclubbing and prefer more laid-back evening fun, Pattaya’s bustling nightlife districts might well be a bit too crowded, noisy and “touristy” for you. But don’t worry, there are more than enough quiet and peaceful spots around town that offer hassle-free entertainment also for couples and families, and where you can sip your drink and chat with friends in a decent relaxed atmosphere. 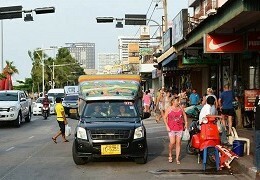 Soi Buakhao, running parallel to (and between) Pattaya Second and Third Road, is a long and narrow, busy side street that links Central and South Pattaya Road in a vertical direction. It’s well worth an extra note as Pattaya’s “Little Britain”. The Soi Buakhao area (including Soi LK Metro, Soi Diana, Soi Lengkee, Soi Chaiyapoon, New Plaza and a few others) is packed with mainly British bars, pubs and restaurants, a large number of affordable guesthouses, and an ever-rising number of Gogo bars, especially on Soi LK Metro which is slowly turning into some kind of alternative Walking Street. Food, drinks and accommodation are rather low-priced in most venues. 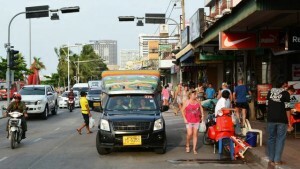 Little surprisingly, Soi Buakhao has become extremely popular exceedingly with British tourists and expats, but also Germans and other mainland Europeans. It should also be noted that Soi Buakhao and its numerous side streets are (still) a mostly Russian-free area. Soi Buakhao is also home to a popular street market held every Tuesday and Friday at the South Pattaya Road end. Jomtien Beach is located just south of Pattaya and Pratamnak hill in its own wide bay and can be reached by taxi in approx. 10 minutes. Most tourist brochures describe Jomtien, with its six-kilometre stretch of sandy beach, as some kind of Pattaya’s little brother, with a little less of everything that might be “too much” over the hill in Pattaya – less red-light districts, less noise, less traffic etc. And in a way, this description is true. Although Jomtien beach is nowhere near either to what travelers may expect from a tropical beach, Jomtien offers a much more relaxed environment for swimming, sunbathing, and enjoying the various beach activities, than Pattaya’s crowded and noisy main beach. And although Jomtien has in recent years become exceedingly popular with Russian family vacationers and Thai tourists from Bangkok, especially over the weekends and on public holidays, the atmosphere here is indeed less “touristy” and the nightlife much more relaxed and laid-back. Then again, somehow this approach doesn’t really do justice to Jomtien. It may not have been until the early 1980s that the first hotels and bungalow huts were erected along Jomtien’s then peaceful and undeveloped beach. And “old hands” have told us that until the 1970s, the area could basically only be reached by a boat trip around Pratamnak hill. But, alas, this era seems like light years ago now. Especially since the turn of the millennium, as tourist numbers and the numbers of expats living in the area have continuously increased, Jomtien has seen a massive construction boom, with dozens of new hotels, condominiums and housing developments built in recent years. For obscure reasons, East Pattaya, i.e. the city areas east of Sukhumvit Road (including Soi Siam Country Club, Soi Khao Noi, Soi Neunplabwaan, Soi Khao Talo etc.) are also known as the “Dark Side.” Except for a couple of tourist attractions and golf courses, the “Dark Side” has only little on offer for tourists, and most holidaymakers may likely never cross the line of Sukhumvit Road that separates the Dark Side from Pattaya’s more “touristy” areas. The Dark Side has, however, in recent years probably become Pattaya’s most popular residential area for Funtown’s ever-growing expatriate community, and is home to hundreds of residential “villages,” affordable guesthouses and apartment complexes. As more and more expats have moved over to the Dark Side, an ever-increasing number of bars, including some very popular short-time bars, have also opened in the area. As venues on the Dark Side cater mainly to the local expat community, prices for drinks and food are usually also cheaper here than in Pattaya’s main tourist areas. While you should rent a motorcycle or a car when staying here, the Dark Side may be a good alternative for long-term tourists who prefer a quieter, slightly cheaper and less “touristy” environment. To cut an endless story short: There’s probably nothing you will not find in Pattaya. No matter what you’re looking for, whether you’re a single male traveler, come here as a couple or family, Pattaya’s simply got it all – something for everyone’s taste and budget! To be honest with all future visitors who have been misguided by euphemistic tourist brochures: Neither Pattaya nor Jomtien beach are among the best beaches Thailand has to offer and can’t compare to those of Phuket or Koh Samui. Although the water quality has considerably improved in recent years, let’s face it, the water is anything but “crystal-clear”. Another downside of Pattaya’s beaches are certainly the hundreds of noisy motorboats and jet skis, and the legions of impertinent beach vendors. Sad but true: Both Pattaya and Jomtien beach in no way resemble what tourists may expect of an exotic stretch of sand in a tropical faraway country; period. Although they’re still great places for lazy sunbathing, it’s primarily all about water activities here. 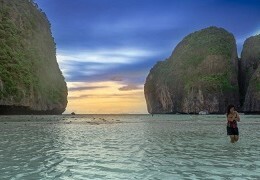 Regardless of whether you’re into scuba diving, windsurfing, parasailing, jet-skiing, snorkelling, banana boat riding, deep sea fishing, or fancy a memorable daytrip to Koh Larn (an island just a few kilometres offshore where you can find idyllic white sand beaches and truly crystal-clear water) – you only have to choose! 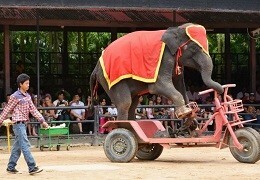 Other activities, besides shopping on traditional markets or in Pattaya’s shopping malls, include bowling, minigolf, jogging along Pattaya’s beachfront, bungee jumping, day trips to local tourist attractions and theme parks, or – last but not least – the “obligatory” sightseeing tour to the nearby capital Bangkok with its amazing temples and palaces. Half a dozen professionally-equipped fitness centres, gyms and Muay Thai boxing schools offer their services to those interested in fitness and martial arts. 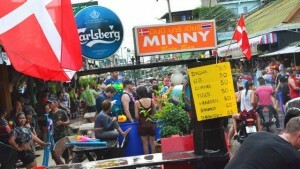 Even a Pattaya Marathon is held on a yearly basis, usually in July. On top of that, Pattaya and Jomtien, with an immense variety of cuisines from different countries and continents, and an abundance of international restaurants of all standards – from simple Thai-style soup kitchens to fine dining gourmet temples – are a great place for dining out! Finally, if you’re in Pattaya mainly for its notorious nightlife and “adult entertainment”, well, you won’t have to look any further and will most likely have the time of your life here. 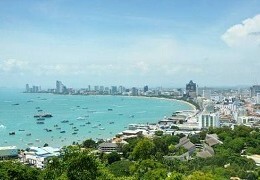 Pattaya welcomes nearly 10 million visitors every year. Tourist numbers have been rising from 5.8 million in 2008 and 7 million in 2011 to “about 10 million” in 2013 (The Nation). Even in 2014 when tourist numbers drastically decreased nationwide, Pattaya still managed to attract 9.1 million visitors, including 6.5 million foreign tourists (PDN). 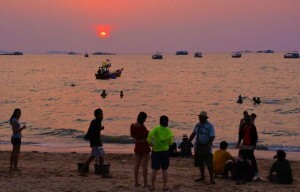 For decades, tourists from the UK and Germany, followed by US-Americans, other mainland Europeans and Scandinavians, had been the predominant groups of Western visitors to Pattaya. Many of them have later settled down in Pattaya, either to start their own business here or simply enjoy retirement. These expats have naturally also had a significant influence on the development and shaping of local culture and lifestyle in Pattaya as we know it today. 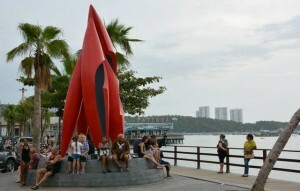 Since the breakdown of communism in the former Soviet Union, more and more visitors from Eastern Europe, particularly from Russia, have started visiting Pattaya every year. Cyrillic letters can now be spotted on an increasing number of signboards and restaurant menus around town. Moreover, there is also an ever-growing number of tourists from China, East Asia, India and the Middle East. Indeed, aside from Europeans, most foreign visitors to Pattaya these days come from Russia or East Asian countries. 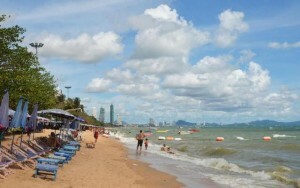 In 2014, the biggest visitor groups were the Chinese, who mainly travel in tour groups and usually stay for short periods only, and the Russians who invade mainly Jomtien and Naklua during the peak of the high season (due to the weakening of the Russian Ruble, their number has sharply decreased in 2015). Indian and Arab tourists mostly stay in South and Central Pattaya. While the number of visitors from the UK, Germany, Scandinavia etc. hasn’t actually dropped over the years, Europeans, Brits and Americans have clearly become a minority in many parts of town (unfortunately). Due to the influx of so many different national cultures over the decades, Pattaya has naturally become one of the country’s most “westernized” and cosmopolitan cities. One side-effect is that you may no longer encounter the “real” or “traditional” Thailand in Pattaya – also because Thai culture itself is rapidly transforming and ancient values increasingly mix with foreign influences; which degrades the postcard image of a “genuine Siam” to a mere tourist guide myth. Instead, you will experience the truly cosmopolitan flair of Asia’s possibly most exciting beach resort. Best evidence are the thousands of international restaurants that serve literally every cuisine from all corners of the globe; Pattaya’s large shopping malls and international supermarkets that cater to the everyday needs of Pattaya’s ever-growing expat community and offer nearly everything you get in your local supermarket back home. Then again, despite being so “westernized”, if you don’t just float with the current of mainstream tourism, you can still encounter traditional Thai lifestyle and culture in modern Pattaya – typical markets and street-side food stalls, Buddhist temples with monks in orange robes, the ubiquitous melodic sound of Thai language and deliciously spicy Thai food. 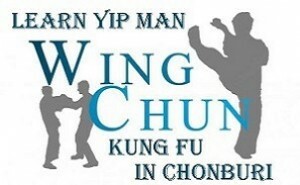 In other words, Pattaya is a melting pot of cultures “Thai-style”. Given the well-developed infrastructure Thailand provides, it’s still one of the cheapest destinations worldwide. One may argue that Pattaya is not as cheap as it used to be in the 1990s or so. But to be fair, prices here are still very reasonable, especially by contrast with Phuket and given the quality of life you get. “Best value for money” so-to-say. It certainly also makes a huge difference whether you buy your beer from 7-Eleven and are happy with a noodle soup at a street-side stall, or require your daily fine dining experience before getting assholed in a GoGo bar or nightclub. Hence, the basic price list below is just a rough guide to how much you may have to spend in Pattaya. For more details on how much money you’ll need as a tourist in Funtown, please check our special pages. Speak German? Um mehr über Lebenshaltungskosten in Pattaya zu erfahren, und wieviel man als Urlauber und Expat so einkalkulieren muss, um in Thailand gemütlich über die Runden zu kommen, schaut doch einfach mal auf unserer neuen deutschsprachigen Pattaya Info-Seite vorbei! can i go to pattaya with my girl-friend and stay in hotel together ,we from from two different country . is that any problem ? No, why should that be a problem? Sorry but I don’t know any. I would also imagine that Pattaya’s traffic doesn’t make life any easier for the blind. The best might be to find a nice girl who can help you find your way around town.